Vinegars There are 36 products. Whether you are looking for something new or looking for simplicity, La Case à Vanilla offers an exclusive range of quality products created by our master vinegar maker Frédéric Chaix. His craftsmanship gives his creations a quality and incomparable taste. 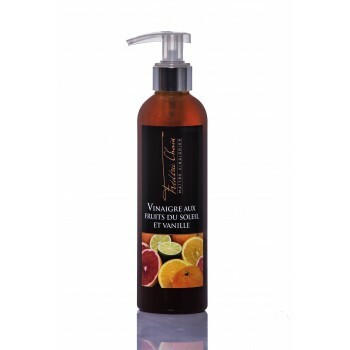 They offer you unprecedented vinegars with Bourbon vanilla from Madagascar and authentic fruit. Our vinegars are characterized by a slightly syrupy fluid texture, sweet and sour taste and a very popular aromatic richness. These blends combine the perfect balance between the sweetness provided by the delicacy of the spices carefully selected and moderate acidity of the vinegar. Our products are made in our shop in Bordeaux and are guaranteed 100% natural: no coloring, preservatives or artificial flavoring. Our aromatic assortment of different variations brings a touch of finesse to gastronomy. Our vinegars are conventionally used to give flavor and character to salads, starters or desserts. In a more original way, they come enhance meat and fish, or bring a fruity note to soft drinks. Discover without delay our seasonings that will finalize all your dishes with relish! This balsamic cream with vanilla from Papua New Guinea is a unique and surprisingly subtle seasoning that will sublimate all your dishes and desserts. Vanilla from Papua New Guinea associated with balsamic from Modena deliver an extremely fine aroma.